Black vinyl finish with scratch-resistant design. Product Highlights make Supersized seem small. acoustic suspension (sealed) cabinet design. Our Item will come in original packaging with original box and accessories. Packaging will be damaged, comes with original box and accessories. This item will be in the original packaging but may not be sealed. May have small minor chip and or dents. 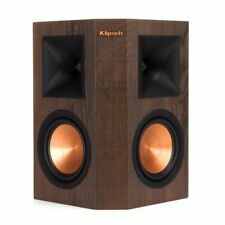 You will receive: Klipsch RP-250S- Walnut Surround Sound Speaker. 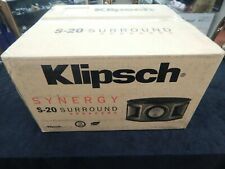 Set of 2 Klipsch Quintet II Black Satellite Surround Speakers. Great Condition. Sound Amazing. These speakers reall pack a Big Punch for their compact size. Buy it Now. You will be Happy. Condition is New and in an UNOPENED box. A Linear Travel Suspension minimizes distortion for enhanced, detailed performance. When paired with the Tractrix Horn-loaded LTS tweeter, it provides speaker efficiency highest in its class. Klipsch RS-52 II Reference Series Surround / Satellite Speakers; RS52II. Condition is Used. Shipped with FedEx Ground or FedEx Home Delivery. Excellent condition and includes ceiling mount kits. Original owner. Original packaging. Lower 48 states only. Price is for one, only one speaker left. Klipsch RP-250S WALNUT COLOR Surround Speaker = 2 Speakers - 1 PAIR!!! Tested and sound Great. But Overall in Nice Condition. You are bidding on a previously owned Klipsch RS-35 Reference Series Single Black Surround Speaker. This auction is for the speaker, instructions, and original box you see pictured. Nothing else is included. It comes as pictured. Please take a moment to look at the pictures and get a better idea of what you are bidding on. This speaker has some scuffs from use. It has been tested and is in good working condition. The cones and screen are both in great shape. Please take a moment to check out my other great items! Thanks ccloan. This item is a Chip & Dent item. The box is opened and the speakers might have some minor cosmetic chips or dents. The Speakers are 100% working. You will receive: 1 Klipsch RP-250S Walnut Surround Sound Speaker EACH - Chip and Dent. Fully tested and in great working order. In great pre-owned shape. This sale is for 3 Speakers. Please see all the pictures for your visual description. Includes tile bridge for installation in any ceiling. Compact design simplifies low-ceiling mounting. Easy to install and adjust settings. Pairs well with our CA surface mount speakers. You will receive: Klipsch RP-250S- Walnut Surround Sound Speaker The Reference Premiere RP-250S surround speakers deliver the highest performing and encompassing sound possible. No other brand can bring this theater-quality surround sound experience into your home like Klipsch. - 1" Linear Travel Suspension Titanium Tweeter - Dual 5.25" Spun Copper Cerametallic Cone Woofer - 90x90 Hybrid Tractrix Horn - All New Tractrix Port - MDF Cabinet with Brushed Polymer Veneer Baffle Finish - Strong, Flexible Removable Grille - Dimensions: 13.5” x 12” x 7.92" 90x90 HYBRID TRACTRIX HORN Redesigned Tactrix Horn utilizes a circular horn throat paired to a square horn mouth to further improve high-frequency response and extension, while enhancing imaging and dynamics. The compressed . The RS-25 is a high-value, high-performancesurround speaker. Key toits performance is Wide Dispersion SurroundTechnology. The cabinet is available in amatte black or white vinyl finish. ■ Back-panel keyhole and threaded insert for wall or ceiling mounting. Wide Dispersion Surround Technology™. sensitivity 92 dB. Tractrix® horn array with dual 1" titanium tweeters. IR receiver knock-out for remote repeater systems. 8-ohm impedance. Quintet Center. HF Crossover: 4900Hz. High Frequency Horn: 90°x40° Tractrix Horn. Enclosure Type: Bass reflex via rear-mounted port. Nominal Impedance: 8 ohms. Power Handling: 100 watts RMS (300 watts peak). klipsch Ref IV RS42 Surround Speakers and Grills, No Reserve! As you can see from the pictures the speakers are in nice shape. I tried to take a close up of the worst flaws being the small piece of laminate and top, middle corner grill fabric. The magnetic grills are in good shape and hold tight. Reference Premiere woofers are housed in a non-resonating, stamped-steel basket that's secured to a large magnet motor for exceptional efficiency and low distortion, and matched to our horn-loaded tweeters for optimal acoustic execution. This creates the cleanest most natural sound possible. No matter which seat you choose this powerful speaker places you in the middle of all the action. Fills rooms with powerful surround sound effects. This technology utilizes two drivers aligned at 90° to one another to create an optimal 180° soundfield. The resulting wide and evenly dispersed soundfield is perfectly suited for rear channel surround applications. 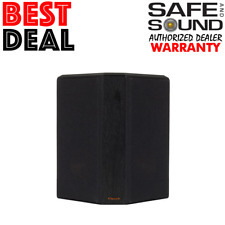 Klipsch HD1000 Satellite Speakers You are bidding on an outstanding pair of Klipsch Quintet Satellite Loudspeakers in PERFECT WORKING ORDER. . Here's your chance to get some great speakers and a great deal. 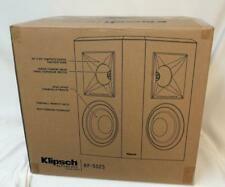 Extended Warranty Available (see details below) These Klipsch speakers are in perfect operational condition. All drivers are fully functional and play superbly. They were used as rear surround speakers in a high-end home theater system. As rear surrounds, they have never had any significant wattage applied to them. Cosmetically they are in outstanding condition as well. There are adjustable wall-mount brackets attached. They can be easily removed if desired. Klipsch WS-24 Rear Surround Sound Speaker Espresso finish. Condition is Used. Shipped with USPS Priority Mail. Shows some wear on the body. Speaker works well! RP–502S Surround Speaker. Premium Scratch Resistant Ebony and Walnut Finishes. FINISH: Ebony, Walnut, Piano Black. Wide Dispersion Surround Technology. Our Spokane, WA, call center staff is highly trained, experienced and non-commissioned. Caleb Denison | Digital Trends. Looking to add more than only surround sound?. We redesigned the Tractrix® horn from a 60×90 horn to a 90×90 horn for a wider dispersion area. Steve Guttenburg and Ty Pendlebury | CNET. Sounds great! This sale is for 1 speaker only- not a pair. As a pre-owned item, there may be scratches, marks, and other blemishes that may not show up in the pictures. We will try our best to fix any problems you may experience. Finishes include ebony vinyl, walnut vinyl and piano gloss. Ebony and walnut models boast satin painted top cap with a scratch resistant finish, while the premium piano gloss cabinet is hand-sanded for a clear, mirror-like finish. THX® Ultra2 certification. Because of its THX® Ultra2 certification, the KS-7800-THX works well with movie presentations playing up to reference levels in rooms of 3,000 cubic feet or larger. Featuring an integrated back box enclosure, the KS-7800-THX's response is both predictable and repeatable.